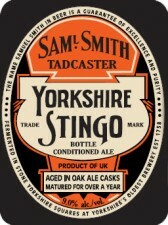 Merchant du Vin and Samuel Smith’s Old Brewery are proud to announce the fifth U.S. annual release of Samuel Smith’s Yorkshire Stingo. This barrel-aged, bottle-conditioned strong ale expresses the elegant refinement of every Samuel Smith’s beer, but with depth, length and power found in no other beer. This is a must-try beer: Extreme meets over 250 years of brewing experience. 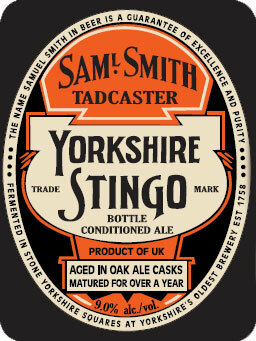 Vintage dated, Stingo is available nationally each year around England’s “Yorkshire Day,” August first. This 2013 release was brewed in 2012, then matured for a year at the brewery. ABV varies a bit each year – this year, Stingo fermented to 9.0% ABV. Production of this fine ale will always be extremely limited. A traditional strong ale that originated in the north of England, “Stingo” is mentioned in literature before 1700. Samuel Smith’s Stingo melds the signature elegance of the brewery’s ales with a long historical tradition. Brewed from British malts and multiple hop varieties, Stingo is fermented in open-topped stone Yorkshire Squares, then aged in oak barrels that previously held cask-conditioned ale, gaining subtle complexity from the wood. Some of the barrels at Samuel Smith’s are over a century old – if a cask is damaged, the coopers carefully replace broken staves and put the cask back into service. Established in 1758, Samuel Smith’s Old Brewery is independent and committed to quality, using the finest ingredients available for their full line of beer, and naturally gluten-free cider. The portfolio also includes seven Certified Organic offerings. In addition to Samuel Smith, Merchant du Vin imports Traquair House from Scotland; Ayinger and Certified Organic Pinkus beers from Germany; Lindemans lambics, Green’s Gluten-Free beers, Du Bocq, and the Trappist beers of Orval, Westmalle, and Rochefort from Belgium.